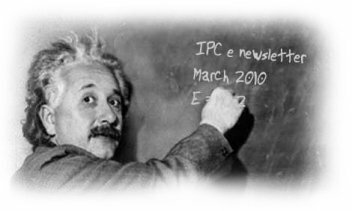 Welcome to the March 2010 edition of the IPC e-newsletter. The IPC e newsletter is distributed free to more than 4000 people around the world. Lets Finish it is a project that exists for one reason, the free and open sharing of knowledge. Your contributions will finish it. He is the climate change chief whose research body produced a report warning that the glaciers in the Himalayas might melt by 2035 and earned a Nobel Prize for his work – so you might expect Dr Rajendra Pachauri to be doing everything he can to reduce his own carbon footprint. But as controversy continued to simmer last week over the bogus ‘Glaciergate’ claims in a report by the UN’s Intergovernmental Panel on Climate Change – which he heads – Dr Pachauri showed no apparent inclination to cut global warming in his own back yard. Hours later, the chauffeur picked up Dr Pachauri from the office of the environmental charity where he is director-general – The Energy and Resources Institute – blatantly ignoring the institute’s own literature, which gives visitors tips on how to reduce pollution by using buses. Dr Pachauri – who as IPCC chairman once told people to eat less meat to cut greenhouse gas emissions – was driven to an upmarket restaurant popular with expatriates and well-off tourists just half a mile from his luxurious family home. The electric car might be kinder to the environment and more suitable for short trips, explained the chauffeur – who has worked for the environmentalist for 19 years – but it was simply too small for Dr Pachauri and a driver to share. ‘When he uses it, he has to use it by himself,’ he said. At his office, Dr Pachauri has at his disposal four electric cars obtained by the institute last year from REVA – the Indian company that makes the G-Wiz cars seen in many British cities. The institute bought the battery-powered cars with the express aim of reducing pollution on short trips by staff around town. One of those cars has been set aside for his personal use. 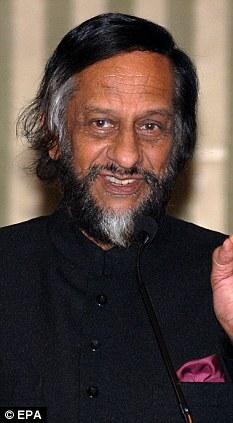 The chauffeur said Dr Pachauri’s family owned or ran a total of five cars. Dr Pachauri used three: the company Toyota, the REVA and an older ‘Ambassador-style car’ – a reference to the smoke-belching, Indian-made Hindustan Ambassador car, based on the vintage British Morris Oxford, that is a common sight at taxi ranks in Delhi. The family’s two other cars are owned by Dr Pachauri’s wife and his grown-up son, also a scientist. The five-star lifestyle and considerable wealth of Dr Pachauri – who is said to wear suits costing £1,000 each – has come under growing scrutiny since he was forced to acknowledge the error of the claims in an explosive 2007 IPCC report that the Himalayan glaciers might melt within 25 years. The humiliating climbdown over the report, which was masterminded by Dr Pachauri and which led to the organisation sharing the Nobel Prize with Al Gore, was followed by calls for him to step down from the UN panel, which he has chaired since 2002. Sudden decline in IQ levels of children and unexplained retardation or hyperactivity among them can now be traced to unacceptably high levels of lead in their blood-sugar levels. In a significant study that could form basis of India’s first legislation on lead-free paints, experts from the Quality Council of India (QCI) have found that over 51.3 per cent children below 12 years in Indian metros have their blood-lead levels above the permissible limit of 10 microgram per decilitre (ug/dl)- a concentration dangerous enough to reduce IQs by four to six units and cause serious developmental disorders. The health hazard has been traced to high lead levels in domestic paints, used on walls in schools and residences, school buses, swings in playgrounds and toys. “Over 93 per cent paints manufactured in India contain added lead, which is severely damaging our children’s health. If we could ban this, we would ensure that every child has about six units of higher IQ. Tragically, symptoms of lead hazard do not reveal themselves easily. A parent, whose child suddenly loses IQ will hardly know that the paint on the child’s school bus is causing the damage,” secretary general of the QCI, an autonomous body under the Ministry of Commerce and Industry, Giridhar Gyani said. The QCI, with a mandate to improve quality competitiveness of Indian products, has now asked the Commerce Ministry to bring a lead-free legislation, directing industry against using added lead in paints. China and Taiwan are about to formulate lead-free paint laws. Times Topics: Peter ApplebomeIt seems every decade here has its own restaging of the same environmental horror story. It began with the old DuPont munitions plant that left behind a trail of lead and mercury, contaminated soil and water and a plume of toxic vapor still capable of leaking into at least 450 houses. The story has no end in sight. There was the initial wave of concern in the 1970s, the first serious opposition by the borough’s government in the 1980s, the $38.5 million settlement from DuPont in the 1990s, a smaller suit and ruling against the company in 2002. Still, the toxic legacy is as real now as it was decades ago. Hence the volatile mixture of newfound hope, raw anger and pent-up frustration Thursday night when residents gathered at the local Elks Lodge. CHARLESTON, W.Va. (AP) — Sen. Robert C. Byrd is criticizing DuPont for what he calls “fundamental and systemic deficiencies” in the safety procedures at its chemical plant in Belle. Federal safety officials are investigating a series of leaks that resulted in the death of one worker and the operation’s temporary shutdown. The Associated Press COVINGTON, Ky. -- A federal jury has found DuPont liable for a chemical leak that sickened and injured three people in northeastern Kentucky. The Daily Independent in Ashland reports that the jury awarded damages totaling just over $9,000 to Arthellia Bates, Phillip Justice and Janet Senters in the second trial stemming from the October 2004 leak at the company's Wurtland plant. The jury last week also found in favor of DuPont on the claims of five other people. Green innovation can save companies money and open up new business opportunities, according to a report released today to coincide with the launch of a new range of eco-paint. Dulux Ecosense has half the carbon and water footprint of the standard paint the company was selling two years ago, the range has cut waste by 40 per cent and volatile organic compounds have been virtually eliminated, meaning no lingering odour. It's just one of a range of green, money-saving and money-making innovations to come out of a three-year project which studied how to improve the sustainability of paint across its whole lifecycle. They are detailed in Paint the Town Green, which explains how businesses in other areas can profit by applying the same sustainable innovation methods. The explains how to carry out sustainable innovation and the business benefits it can achieve. Authorities are investigating the source of chemical vapors that entered as many as 50 homes near the Nuplex Resins plant in southern Louisville earlier this week, sending at least two families to hotels to escape the irritating odors. Metropolitan Sewer District crews sampled gases in sewer lines Monday and Tuesday and were working with government officials and the company to determine the cause, said Lisa Gaus, who oversees industrial waste issues for MSD. She said that although 30 to 50 homes may have been affected, there was no apparent threat of explosions. By Tuesday afternoon, a day after MSD had blocked the sewer line from the plant at 4730 Crittenden Drive, volatile organic compounds had dropped significantly and were near typical levels, she said. DENVER - Coming up with a rainbow of colors is easy for paint companies. But lowering the levels of volatile organic compounds, or VOCs, has been a lot tougher. Those VOCs contribute to ozone, smog, and respiratory problems. When Consumer Reports has tested low-VOC paints in the past, testers found that they didn't do very good, particularly at covering the darker colors. Consumer Reports' latest tests of more than 50 paints still find problems with some paints that claim zero VOCs. For example, the Freshaire Choice from Home Depot. It didn't cover well with one coat, and even with two coats it didn't do a great job of covering. Officials last week could not pinpoint the source of the problem, saying they were looking into two possibilities: a wastewater spill reported by Nuplex Resins last Monday, or groundwater under the plant that might have been contaminated. Art Smith, the on-scene coordinator for the U.S. Environmental Protection Agency, said Monday night that the investigation points to an overflow from a tank. SAVES BOTH INSTALLATION AND OPERATING COSTS. Mitsuba recognizes the unique Indian environment and the special needs of small and medium industries in India. Mitsuba is the only Indian company to manufacture Automatic systems with Oscillators having inbuilt SPRAY POLICE Part sensing system. The Oscillator offers reliable, time tested, low cost automation and the SPRAY POLICE – will trigger guns on and off as needed to save valuable powder from being unnecessarily over sprayed. Mitsuba will provide complete technical assistance to determine your exact needs, set up the system and offer full training and support for optimizing your coating operation. Follow the link to view the Mitsuba Oscillator along with Spray Police part sensing system in operation. Mitsuba will be delighted to help you to take your powder coating & profit to new higher level. The international coating industry will meet once again in Karlsruhe from the 13th through the 16th of April, 2010. Offerings covering all aspects of liquid painting, powder coating and coil coating will be presented more comprehensively than at any other technical trade fair worldwide. This makes it possible for companies with in-house painting facilities and job shop coaters to gain an extensive overview of the latest developments and trends for painting and coating processes, and for all of the pertinent process steps from pre-treatment right on up to inspection. About 300 exhibitors, more than at any other specialised event for coating technology, will present innovative products and target oriented services which make painting and powder coating processes more flexible, more reliable, more economical and more environmentally sound. Gather information regarding solutions with which you can hone your competitive edge and secure a competitive advantage – regardless of whether you paint or coat metals, plastics, wood, glass or other materials. The PAINTINDIA 2010 International Exhibition-Conference will be held at Hall No. 6 at Bombay Exhibition Centre, Goregaon, Mumbai from 4-6 March 2010. With this edition, the event has reinforced its status as not only the undisputed leading event of its kind in India and this part of the world, but the globe over. It is organized under the aegis of Expocon International, a division of Colour Publications Pvt Ltd, publishers of PAINTINDIA, the only journal in India for the coatings, inks and allied industries, which has been serving the industry for over 58 years now. There are over 180 exhibitors at the event, and various conference modules related to various technical and application aspects of coatings. The main Highlight would be the session of Powdercoat on the 5th of March at Hall no 1 from 11.00 am to 01.00 pm. Powder Coatings: Coatings for the Future? Do visit our web-site www.paintindia.in to learn more about the event, and also to pre-register yourself as a visitor to the exhibition, or as a delegate to the conferences. The Engineering Expo in Indore. 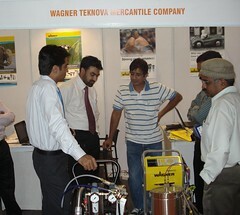 The Engineering Expo, India's Premier Industrial Trade fair was held in Indore between February 19-22, 2010. It included several participants from Machine Tools & Accessories, Hydraulics & Pneumatics, Plastics, Packaging & Auxiliaries, Electrical & Electronics, Material Handling & Safety Equipment, General Engineering sections. Engineering Expo offers excellent opportunities for establishing contacts, initiating joint ventures and doing business. The fair at Indore will brought together some of the biggest names from the industry, both from India and other parts of the world. Machine manufacturers, raw material manufacturers, distributors and financial organisations. Some of the leading companies taking part in this exhibition include. 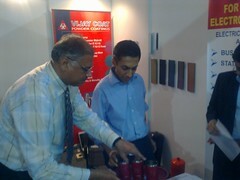 Among the finishing industry Statfield, Wagner and Vijay Coat displayed their products. Bright colours of recovery for paint companies. Aresurgence of growth in the residential real estate and automobile markets augurs well for their suppliers. Paint companies top the list for several reasons. A revival in production of cars and construction of houses means higher sales for paint manufacturers. More importantly, the return of consumer confidence as the outlook on jobs and incomes improves leads to a big improvement in the market for repainting homes. This business is the one that delivers on margins for paint companies. And last, the inputs used by paint companies have actually become cheaper compared with the year-ago period, which is resulting in very high margin levels for the firms. 2010-01-29 - Jotun will supply 400,000 litres of paint to the bridge in China, which has a designed length of 6,2 km. The paint supply contract for Taizhou Yangtze Bridge in Jiangsu Province in China is an important milestone in the bridge segment. It was signed by Jotun Protective Coating China in December 2009. With 2×1080 meters spans connecting three towers, the Taizhou Yangtze Bridge will be the biggest three-tower suspension bridge in the world. ”Frequent visits to both the owner and contractors, in addition to Jotun’s strengths in products, service and teamwork, helped us to win this contract. The success in this project, indicates that Jotun has taken the top position in the market and been fully recognized by the customers in the industry”, comments Sales Director in Protective Coatings, Mr Liu Wei. Electrolux has been able to achieve substantial energy savings of up to 15 percent when compared to the old production line process by using ABB robots. Every second of every day in any year around the world, Electrolux sells two of its products. This is an impressive feat, and requires state-of-the-art manufacturing facilities, such as the first fully automated and flexible powder coating facility for oven and grill cavities recently installed at Electrolux’s manufacturing plant in Dudley Park, South Australia. Utilising four ABB six-axis robots to control powder coating gun movement, the new automated process ensures a consistent and superior high gloss ceramic coating for over 2000 oven and grill cavities a day, and a coating material efficiency improvement of 10 percent. A strippable paint coating that can decontaminate itself after absorbing chemical agents is the aim for scientists at the Defence Science Technology Laboratory (Dstl). Currently, strippable coatings are used on military vehicles in theatre to change the colour of vehicles quickly. The application of these coatings requires minimal training and can easily be applied and removed by soldiers. 90 % of the coatings can be removed by scoring flat areas with a knife and then manually peeling it off, complex areas can be scored and then removed with high-pressure water. The coatings also have a use in temporary camouflage as the paint can be used to flexibly adapt a vehicle’s colour and glint signature, reducing the vehicle’s visibility. The current generation of coatings have at least a 12 month life span on the vehicles. Researchers evaluate the coatings for use in decontamination to become the next coatings generation which will be able to absorb chemical biological and radiological agents (CBR), therefore protecting those operating inside and around the vehicle. Furthermore the chemists look at reactive coatings which would contain catalysts and possibly enzymes in order to create self-decontaminating coatings. A new catalyst made of a composite oxide, based on cobalt and cerium, that is able to completely eliminate volatile organic compounds (VOCs) and odours at a temperature of 200C, comparable to platinum-based catalysts, is reaching the final stage of development at the Tokyo Metropolitan Industrial Technology Research Institute. The institute said that the cost of manufacturing the new catalyst is approximately 20% – 30% that of platinum-based catalysts, because of the comparatively inexpensive raw materials. It plans to develop VOC-treatment equipment containing the catalyst priced lower than existing equipment, and will be intended for small and medium sized enterprises (SMEs). In tests conducted involving the treatment of toluene, the researchers confirmed that the new catalyst completely decomposed the VOC into carbon dioxide and water at 200C. COLUMBUS, OH – The Board of Directors of Hexion Specialty Chemicals Inc. has approved construction of a manufacturing plant in Onsan, Korea, to produce Cardura™ monomer. The plant will be constructed within an existing Hexion manufacturing complex in Onsan to produce Cardura monomer, which is a glycidyl ester derivative of Versatic Acid 10. Cardura monomer is used extensively as a key ingredient in environmentally advanced coatings such as automotive clear coats, coil coatings and marine coatings where high-solid, water-based formulations and low VOCs are desired. CHARLOTTE, NC – Effective Feb. 15, 2010, or as contracts allow, BASF will increase its prices on all STYROFAN and STYRONAL styrene-butadiene latex products by up to $0.06 per wet pound in the United States and Canada. STYROFAN and STYRONAL products are used as ingredients for various applications in the adhesives, architectural coatings, sealants, construction, paper and nonwovens markets. Also effective Feb. 15, 2010, or as contracts allow, BASF will increase its prices for all BUTONAL and BUTOFAN styrene-butadiene high- and medium-solids latex products by up to $0.08 per wet pound in the United States and Canada. BUTONAL and BUTOFAN products are used as ingredients for various applications in the adhesives, carpet, construction, fiber bonding, automotive and foam markets. WILMINGTON, Del., Feb. 17 /PRNewswire/ -- DuPont Titanium Technologies announced a price increase for all DuPont™ Ti-Pure® titanium dioxide (TiO2) grades sold in Europe, Middle East, and Africa regions. Effective March 1, 2010, or as permitted by contract, net prices in the Euro markets of Western and Central Europe and North Africa regions will increase by 100 Euros per metric tonne. Effective March 1, 2010, or as permitted by contract, net prices in the U.S. dollar markets of Eastern Europe, Middle East and Sub-Saharan Africa regions will increase by $150 per metric tonne (USD). DuPont Titanium Technologies is the world's largest manufacturer of titanium dioxide, serving customers globally in the coatings, paper and plastics industries. The company operates plants at DeLisle, Miss. ; New Johnsonville, Tenn.; Edge Moor, Del. ; Altamira, Mexico; and Kuan Yin, Taiwan; all of which use the chloride manufacturing process. The company also operates a mine in Starke, Fla. Technical service centers are located in Paulinia, Brazil; Mexico City, Mexico; Mechelen, Belgium; Dzerzhinsk, Russia; Kuan Yin, Taiwan; Ulsan, Korea; Shanghai, China; and Wilmington, Del., to serve the Latin American, European, Middle Eastern, Asian and North American markets. PPG Industries appointed John R. Outcalt vice president, automotive refinish. Outcalt will assume global responsibility for PPG’s automotive refinish business effective March 1. Outcalt is currently vice president, automotive refinish, Americas. He will continue to be based at PPG’s automotive refinish business headquarters in Strongsville, Ohio, and to report directly to J. Rich Alexander, senior vice president, Performance Coatings. HYDERABAD: DuPont India, on Monday, said it is expanding operations at its Knowledge Science Centre, Hyderabad. The company has already committed Rs 130 crore investments at its first integrated R&D centre and has charted out plans to double the investments over the next three years, besides increasing the total number of scientists from 250 to 600 over the next two years. The IFH Group Inc. announced February 2 that it has acquired Williams Powder Coating of Phophetstown, Ill., and created a new division – Powder Coaters LLC. Powder Coaters LLC is the latest step in The IFH Group’s vertical integration program that will complement the company’s extensive capabilities in fabricated metal products of virtually all types and sizes. Bayer MaterialScience, a unit of German industrial giant Bayer, has committed to continuing its investment in a toluene diisocyanate (TDI) project in Shanghai with the goal of expanding the production site, a top company executive said. The company, one of the world's largest polymer makers, is expected to have the mechanical completion of the TDI facility project completed by the end of 2010, with an initial production capacity of 250,000 tons per year, said Michael Koenig, president of Bayer MaterialScience Group China. The company is also hoping to reduce energy consumption by 40 to 60 percent through advanced technology in the manufacturing of TDI. The chemical is often used in the manufacture of flexible polyurethane foams used in furniture, bedding and automotive and airline seats. A topflight team of products made by PPG Industries’ aerospace business for the Boeing 787 Dreamliner jet will simplify maintenance and reduce costs for airlines while enhancing the flying experience for crews and passengers who take to the skies aboard the world’s newest jetliner. Dreamliner jet flight-deck crews will view the world through commercial aviation’s largest windshields by PPG, kept clear of fog and ice with gold and indium-tin oxide heating systems. For passengers, the view will be through Alteos interactive window systems by PPG, commercial aviation’s first electrochromic window shades, powered by an interactive system that passengers control. Alteos interactive window systems use electrochromic technology by Gentex Corporation, the worldwide leader in electrochromic devices for automotive applications. Maintenance will be simplified, environmentally responsible and less costly with PPG’s selectively strippable system of coatings. PPG Aerospace supplies the only complete coatings system qualified by Boeing for the 787. Corrosion Protection Coating works in temperatures to 1,100°F. February 23, 2010 - Applied using pneumatic spray equipment, brush, or roller, Corr-Paint(TM) CP4095 orange-pigmented coating provides corrosion protection and color identification on aluminum and steel structures in harsh industrial environments. Single-part, silicone-based, water-dispersible coating system adheres to sandblasted and marginally prepared metal surfaces as well as relatively smooth or rusted surfaces. Coating is resistant to oxidation, UV light, humidity, and salt spray. Bayer MaterialScience (BMS) has opened a new 200 tonne/year pilot facility for manufacturing carbon nanotubes at its site in Leverkusen, Germany. The facility is claimed to be the largest of its kind worldwide. However, Belgium-based Nanocyl plans to start up a 400 tonne/year carbon nanotube production unit in July. BMS says it will tap into demand for multi-wall carbon nanotubes in a variety of different applications. Cashing in on the recovering economy and festive season, India’s largest paint company, Asian Paints, turned in a stellar set of numbers for the December 2009 quarter. The company has managed to extract better operating leverage, even as raw material prices remained benign. Visitors to the Architect 2010 exhibition will have an opportunity to subject their own homes to a virtual makeover courtesy Asian Paints, the Sri Lankan unit of the Indian headquartered multinational paint company. AMSTERDAM -- Akzo Nobel NV, the world's largest maker of paint, reported a smaller net loss for the fourth quarter on Thursday as a big write-off hit last year's results and demand began to recover in its key markets. Net loss was euro60 million ($81.5 million), versus a loss of euro1.51 billion in the same period a year ago. Sales fell 7 percent to euro3.31 billion. KOLKATA: Remember how you fretted when you returned to the parking lot to find someone had made scratch marks on the car? Or wondered if it was possible to have a building paint that could weather the intense rain and blazing sun instead of fading and flaking off in a few years? Get answers to these questions... ? How does a spray gun work? ? How do I properly set up a pressurized system? ? How do I solve equipment and finish defect problems? venue – Hotel Presidency, Ernakulam-682016. I have been fan this website for longtime. Hey Vivek, Great to see you. Been on your web site for many years. Just wanted to let you know, we immensely appreciate your continued support and look forward to working with you more closely.